Roughly two thirds of homes in the Greater Seattle area have either a cat or a dog (or both!). Chances are many of these homes are difficult to keep clean. You may feel lost when it comes to knowing how to best take care of your four legged pal and your home’s interior at the same time. When it seems like the hair shedding and animal-made messes are too much to keep up with, remember these five cleaning tips for pet owners. Daily routine: As tiresome as it can be to make cleaning a part of your daily schedule, it is important to stay ahead of the mess. A quick vacuum of your living room or wipe down of where your furry friend tends to lay will help to keep hair and other pesky messes from building up. Cleaning up small messes every day is much easier than big tasks less often. Care for carriers: Pay special attention to your pet’s sleeping areas. Does Sparky spend a lot of time snoozing in his kennel? Does the cat prefer to nap in her carrier? Keeping the areas that your animals frequent clean will in turn keep your pet clean, and less likely to carry a mess from their space into yours. Fresh feeding: When was the last time you washed your pet’s food dish instead of just refilling it? Run your animal’s food and water dishes through the dishwasher at least once every other day to not only help keep them healthy, but to cut down on mold and mildew that can easily collect near their eating space. Easy seating: If you are like most pet owners, your animal probably spends a lot of time with you on the couch or in your bed. Make clean-up of those areas simple by investing in easy to wash blankets and pillows. Instead of fussing over your pet every time it leaves a little hair behind, easy-to-wash blankets and other seating/sleeping accessories will make your cleaning routine stress free. Ditch chemicals: You’d never do anything to harm your pet, so why use cleaning chemicals that could? When cleaning your home, opt for nontoxic cleaners that allow for a safe environment for both you and your pet to live in. Natural solutions like lemon juice are a great option as well, both for the incredible smell, but also for the safe detoxifying nature of the fruit. 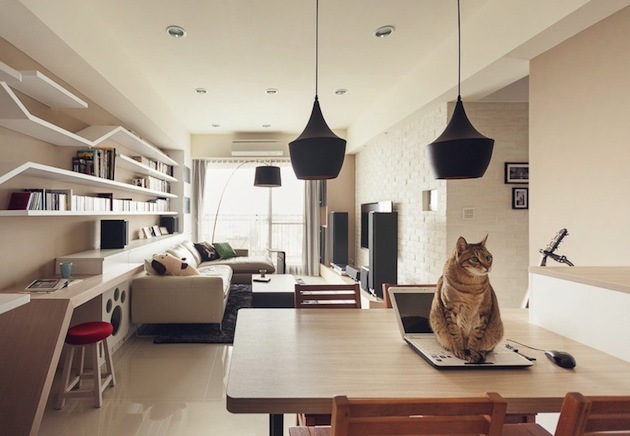 While pets can add to messes in your house, your home would not be the same without them. In addition to your own cleaning routine, consider hiring a professional to give your home the deep clean that it deserves!